Since launching The Breeze in 2002, the Meyer Broadcasting Corporation (MBC) has expanded to four Internet radio stations, featuring Easy Listening Music, all vocals, and nostalgia, as well as national news and weather. If you’re a fan of Internet radio, you have experienced all of the ups and downs that it’s been through. Many of the changes have been fueled by the battle over music royalties as the licensing bodies, the artists, the stations and the Copyright Board try to figure out how to make it all work. What happened to your favorite player? 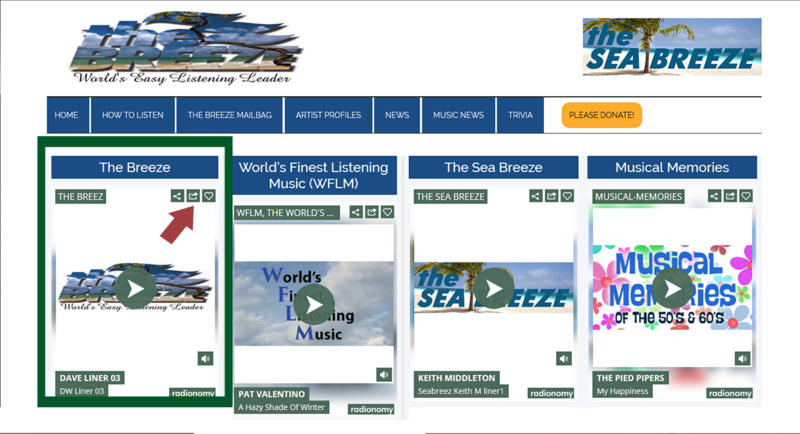 The Breeze Family of stations is currently using the services of Radionomy to deliver your favorite music. 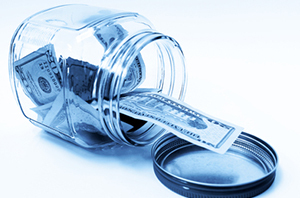 MBC pays a fee to Radinomomy and it takes care of all of the music royalty fees. In a move that caught stations and listeners, alike, off guard, recently, Radionomy made the decision to stop supporting some media players for listeners in the United States. These include Windows Media Player, Real Player, Reciva and the Grace Internet radio. Radinonomy does still support iTunes and WinAmp players. Click for a larger image showing the pop out arrow. How Can I Listen Now? As things get sorted out, we’re working to make sure you can continue to listen to our stations. The optimal way is to tune in via one of the players on our home page. Click on the arrow in the upper right corner of a player, next to the heart and you can pop it out of the webpage. You can also click on one of the links to open WinAmp or iTunes. 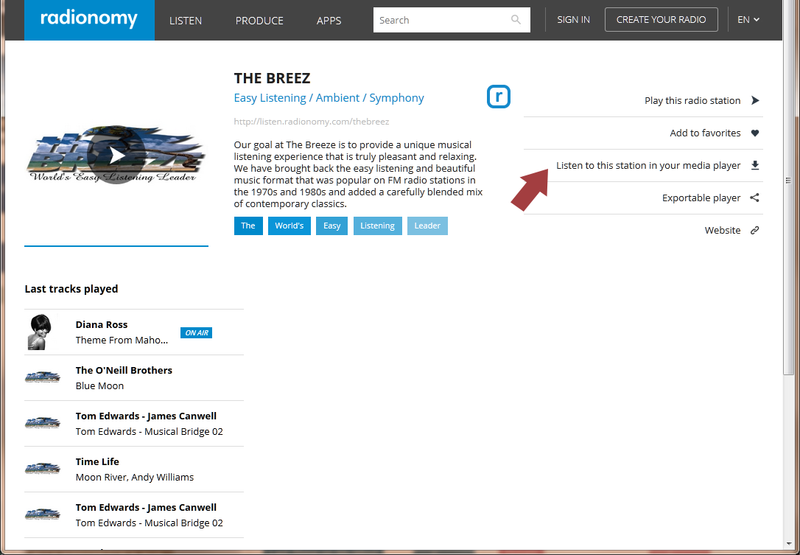 You can also download an app from the Radionomy site or listen directly from the station page at Radionomy.com via links included in the list on this page. As always, Meyer Broadcasting Corporation will do its best to keep the music playing and will try to let you know what we know as soon as we know it. Thanks for your patience and your continuing support in what can be frustrating times for us all. Click for a larger version of the image. Here are the links to the station pages. Visit the page and click on the link on the right to listen in your media player. This page also has a list of the most recently played songs for each station. 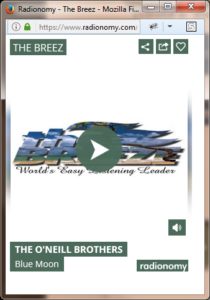 The Breez is one of the true easy listening formats online, playing about 4 instrumentals for every vocal with national news and weather at the top and bottom of the hour. The Sea Breeze, The World’s Greatest Vocals, signed on in 2015 featuring many of the standards and easy listening vocals comparable to those heard on The Breez. The World’s Finest Listening Music, added in early 2016 which features some of the beautiful music we first aired in the original WFLM-103.9 in Crown Point, Indiana in the 1970s and 1980s. Musical Memories, is our newest station, a trip down memory lane, playing the hits and memorable melodies of the 1950s and 1960s. It also includes nostalgia segments like “Do You Remember?” and “Old News” each weeknight at 6 P.M. Central Time (United States). Soon to come, audio from vintage televisions commercials of the 1950s and more.